Describe the Journey Builder activities. Create a journey plan for a multichannel campaign. All the preparatory implementation tasks are complete. It’s time for Leung and Chinua to create a journey plan that combines the promotional email and Facebook advertising. Chinua navigates to Journey Builder. To make sure they can take full advantage of Journey Builder’s easy-to-use interface, he checks the Builder pane. He confirms that the pane is configured to include Ad Audience and Ad Campaign activities. With Journey Builder’s drag-and-drop interface, it’s easy to create a journey plan. Leung takes the lead and clicks Create New Journey, then selects Create Journey from Scratch. A blank journey plan canvas appears. There’s a note on the canvas indicating that each journey starts with an entry source. The entry source tells Journey Builder where the customers entering this journey come from. In this case, they’re the contacts in the hiking_shoes_email_audience_DE data extension. So, Leung drags an empty Data Extension from the Builder pane to the journey plan canvas. On the canvas, she clicks the data extension and is prompted to enter configuration details. She sets the data extension source to hiking_shoes_email_audience_DE. Then, she continues building the journey by dragging activities onto the journey plan canvas. There are a variety of activities to choose from. Send Email. Send the hiking shoe promotional email to contacts that reach this point in the journey. Wait. Keep contacts from reaching the next activity for a set time period. Engagement Split. Divide contacts based on their behavior, such as opening the email. Decision Split. Divide contacts based on a change in the contact’s data, such as a purchase date change from null to a valid date. Join. Direct email recipients who don't open or click through the email or make a purchase down the Facebook shoe Ad Campaign path. Ad Audience. 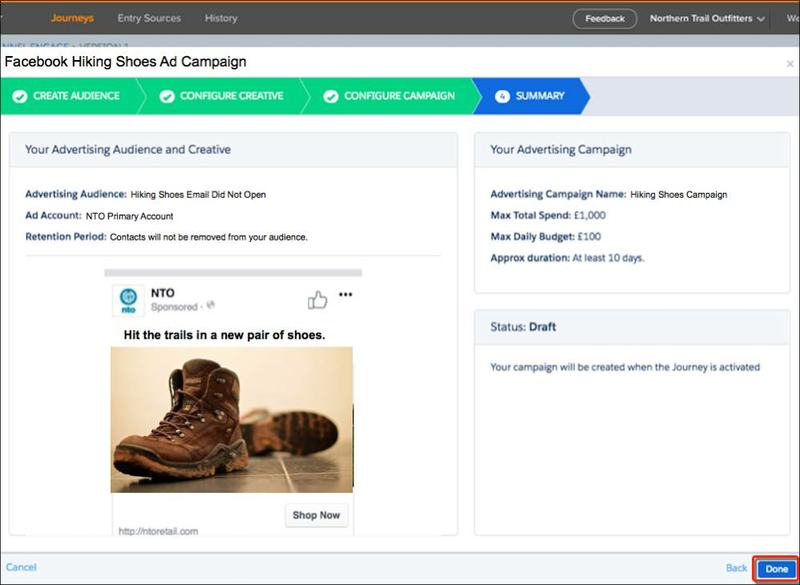 Create a Facebook Advertising Audience of customers who purchased hiking shoes. Use it to cross-sell fitness trackers on the Facebook ad network. Ad Campaign. Create a Facebook Advertising Audience and a Facebook Ad Campaign. Target email recipients who don't purchase hiking shoes. Leung uses engagement splits to evaluate how contacts behave, divide them into separate audiences, and direct them down different paths. Contacts who open the promotional email and purchase hiking shoes go down a fitness tracker Facebook cross-sell path. Contacts who make it to the Ad Audience activity are added to a Facebook fitness tracker ad audience. Chinua showed us how to create the Facebook lookalikes seed ad audience in Advertising Studio. Here, Leung shows us that you can also create an ad audience in Journey Builder. She drags an Ad Audience activity to the journey plan, clicks it, and enters configuration details. Unengaged subscribers flow down three inactivity paths: unopened email, no email click through, and no purchase. 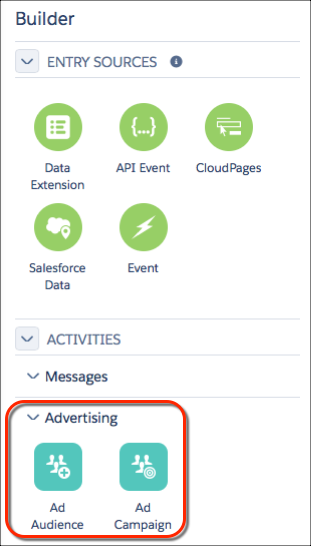 These three paths are joined into a single path that contains an Ad Campaign activity. Contacts who make it to the campaign activity are added to the target audience for NTO’s Facebook hiking shoe ad campaign, hiking_shoes_Facebook_audience. Leung thinks the Ad Campaign activity is the coolest activity in the bunch. It allows her to create a complete Facebook ad campaign in Journey Builder—even the creative part. The Ad Campaign Setup Assistant guides her through the tasks. Create Audience: Create an advertising audience for NTO’s Facebook hiking shoe campaign. Configure Creative: Create the content for the hiking shoe ad. Leung showed us how to create the promotional email in Email Studio, but it can be created in Advertising Studio, too. Configure Campaign: Set the total spending cap and maximum daily budget for the hiking shoe campaign. Bidding is set to AutoBid. For more flexibility, Leung can use the ad network’s budgeting features. Summary: Review and save the campaign. Leung completes the steps and clicks Done to save the campaign. Wait for it...the campaign isn’t immediately active on Facebook or in Advertising Campaigns. Within Journey Builder, it’s saved as a draft. When the journey goes live, Journey Builder creates the audience and sends the campaign to Facebook. As users flow through the journey, they’re added to the hiking_shoes_Facebook_audience, and the audience is synced daily with Facebook. It can take a while for a large audience to process through Journey Builder, then through Advertising Audiences, and over to Facebook. Also, Facebook requires a minimum number of people in a custom audience before a campaign starts to deliver results. After a contact takes an action, such as makes a purchase, or a specific amount of time has passed, it’s good practice to remove the contact from the target audience so they no longer see an ad. Leung wants to stop displaying the Facebook shoe ad to a contact 10 days after they were added to the audience. In the Journey plan, she adds a Wait activity and an Ad Audience activity. When the wait period expires, the contact is added to the exclusion audience and the ad is suppressed for that contact. She uses a similar design to discontinue cross-sell advertising to contacts who make a purchase. Leung and Chinua now have a fully implemented journey. It’s poised to send emails, track clicks, opens, and purchases, and to create Facebook audiences and campaigns on the fly. What’s left to do? There’s one remaining task and it's implemented outside the journey: Facebook lookalikes. Leung completes that next.